Get ready Brooklyn, because Country music is about to takeover. 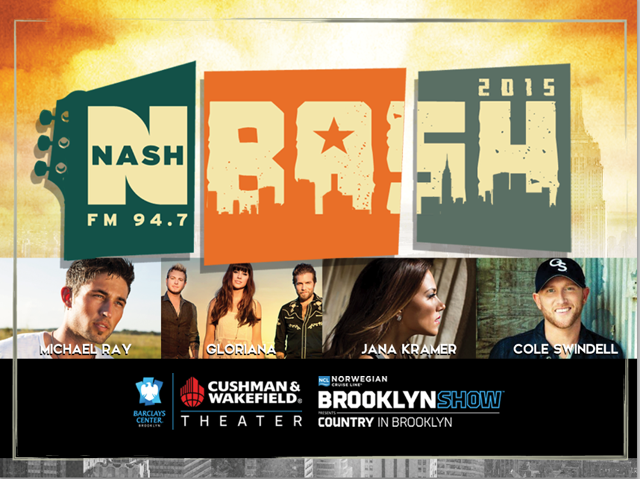 Nash FM 94.7 just announced that their Nash Bash 2015 will be at the Barclays Center in Brooklyn this year! The show, held on March 24th, will feature headliner Cole Swindell, along with Gloriana, Jana Kramer, and Michael Ray. Tickets go on sale Wednesday, February 25th, with pre-sales starting Tuesday, February 24th. Head over to Nash FM 94.7 for more info! Listen to Cole Swindell’s latest single, “Ain’t Worth The Whiskey” below. Be sure to follow Nash FM 94.7 & Secret Fangirls for more updates!